All these measures are in contrast to some other countries where fishing boats and more intensive technologies are applied. It has been much more difficult to manage these changes in the rest of Europe. The majority of fishermen have yet to engage in a sustainable agenda. However new strategies are emerging. For example in France under the direction of the National and River Basin District Plans catch quotas and a boat scrappage scheme has significantly reduced fishing capacity and catches (the number of boats has been halved). There has been and probably will be further reductions in catch quotas for successive years. For some river basins there are opportunities to develop more responsible and sustainable fishing practices. The listing of the eel Annex B list II by Cites has for the moment restricted trade to within the European community. Without the Asian market there are no longer the financial incentives that encourage extreme and insensitive fishing practices. “Eliminate risk prone decision making”This is a call by the professor to end the political and high level decision on quotas and to get away from national politics driven from a centralized and short term approach. Instead he advocates giving decision making on fishery management to local bodies that operate within frameworks designed to achieve long term and sustainable objectives – this matches the words and sentiments of the European Fisheries Fund. The Sustainable Eel Group is the new stakeholder grouping representing a range of interested parties from Europe that include government organisations, scientists, nature conservationists and industry stakeholders that wish to make sustainable decisions that meet long term social, environmental and commercial needs.It is also important that there is co-ordination and co-operation between the River Basins of Europe. It is generally accepted that the eel constitutes one panmictic stock found all over Europe, Northern Africa and the Mediterranean. This wide distribution area, however, is effectively fragmented over thousands of river catchments, with little or no natural interaction in-between while protecting the species to some extent it does produce an anomaly that a sustainable river basin could easily be supporting an unsustainable one. Eliminate Catch Quotas and instead implement controls on the amount of fishing and to require people to keep what they catch. This theme of Callum Roberts is aimed at ending the huge and pointless waste of fish being caught and then dumped at sea because the landing quota had already been achieved. These sort of practices because of the very specialist techniques involved has not been directly applicable to the eel industry. Currently there is no quota system for eels in operation in the UK. At the present time as there is only limited commercial exploitation of adult eels in England and Wales. There is merit in controlling or temporarily stopping the recreational fishing for adult eels. It is highly desirable to increase the numbers that successfully return to breed in the Sargasso Sea. The demand for eels can be met through aquaculture where the survival of glass eels to market weight is significantly greater than in nature. UK Glass Eels greatly favours the suspension of exports of glass eels to Asia during the recovery period. There is also a case to be made for using aquaculture to take glass eels and over a few months grow them into fingerlings with their far higher survival rate and release them into wetland habitat above the obstructions on ecologically sound river systems. Whilst this is not a long term solution (unblocking and passes would be) it is a cost effective and faster way of using the available habitat. (The choice of site would need careful planning). The larger eels have a greater ability to negotiate many but not all of the typical barriers The Sustainable Eel Group team in conjunction with the UK Environment Agency and local Rivers Trust using a revised habitats model has been able to set priorities for removing these obstructions. Require fishers to use gear modified to reduce by catch and Ban or restrict the most damaging fishing gearThe traditional hand net is the only legal fishing instrument on the Severn. It is an environmentally sensitive fishing method. The catching is very species specific. There is no by-catch and no impact on larvae or other aquatic life. There is a 98% survival of the catch. UK Glass Eels is very aware that glass eels are sentient animals that require a high degree of management and husbandry by skilled trained staff from their point capture to their point of release. Though we do not have data for the carbon foot print of fishing activity it is highly probable that one person fishing with a hand net has a significantly lower foot print than a 15 meter 300 HP trawler. While attempts are now being made to develop new nets and fishing practices there is a huge body of evidence to show that most of the French Fishery does not meet these basic sustainable criteria. Glass eel mortality could be as high as 50% from point of capture to point of release. We are highly critical of the current French fishery practices and standards and we welcome the latest initiative on the Loire to reduce catch mortality. However this initiative is handicapped by the regulatory authorities who will not relax rules on net design. Implement extensive network of marine reserves that are off limits to fishing. For the eel reserves this would mean both marine and freshwater – with regard to the former little is known about the marine life cycle there is an undetermined resident coastal marine population that is largely unexploited with only limited knowledge of the life cycle. For the UK under the national eel plan an area of the UK has already been reserved for glass eel recruitment. The terrestrial programmes of land management and water framework directive is promoting a more sustainable future – The immediate challenge is to get enable more glass eels to pass the barriers and on into the wetlands and to maximise the number of silver eels returning to the oceans to breed. In the short term restocking with glass eels or juvenile eels will increase the local population. Hand net fishing – Trawling. Understanding the methodology and outcomes. The principal driving force for glass eel migration depends largely on the tidal ratchet mechanism which can transport glass eels upstream several kilometres a day. It is during this period of immigration that the glass eels are to be found in the water column and are easily captured by mid water trawls. There is however an additional active sub-migration stimulated by tide and specific local conditions that can be exploited using traditional hand nets. When the tide starts to ebb the glass eels drop out of the water column and congregate close to the river bank. Under certain conditions the glass eels will then actively swim upstream in a column 10 to 20 cms wide close to the bank. It is only under these very special conditions that the traditional hand net is effective. The hand net is placed on its side close to the bank, with the mouth of the net facing down stream against the migration. The glass eels will swim into the hand net and providing there is sufficient water flow through the back of the net, to stimulate the migration, the glass eels will continue to swim against the back of the net as opposed to round it. The glass eels are not caught by any active scooping action. It is a completely passive method of fishing. This active migration will last for just a few minutes to a few hours depending on local conditions. Unlike hand net fishing, trawling for glass eels offers a greater opportunity to fish. It is much less affected by local conditions such as light, temperature, water flow and river conformation. A mechanised fishing system is much easier to manage and is more likely to be prolonged. Fishing effort is principally limited on an economic return based on the cost of oil. The hand net has a significant number of constraints when compared with trawling. 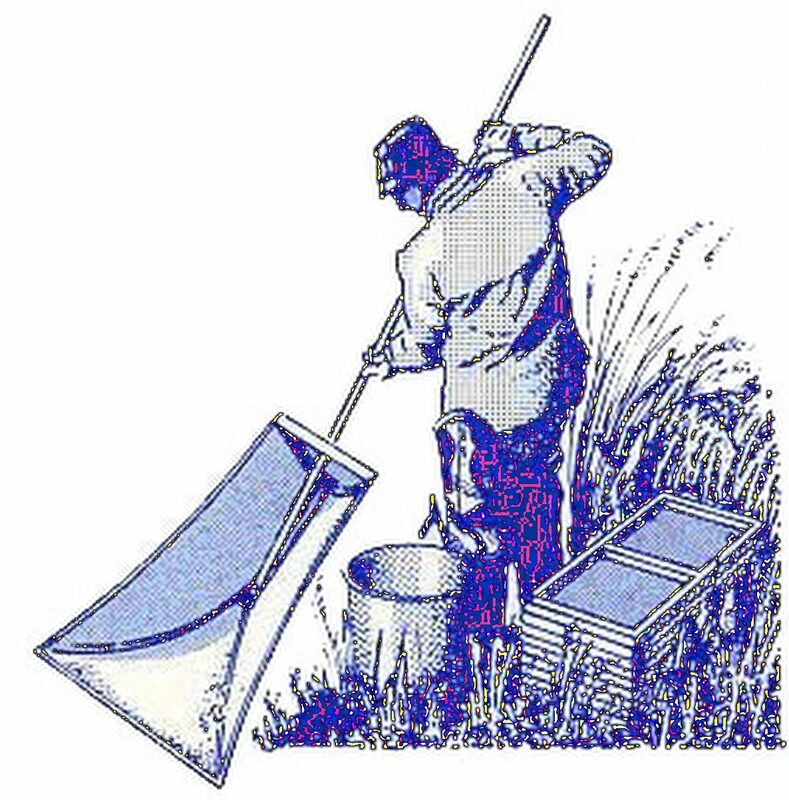 The successful use of a hand net requires a high degree of skill. There is only a very small window of opportunity of the hand net to be effective. It is highly dependant on local conditions. The fishing effort is constrained by human endeavour and physical strength. Based on this analysis it is easier to understand why the glass eel hand net is more likely to meet the objectives set out in Callum Robert’s Common-Sense Reforms and the Strategic Objectives of the European Fisheries fund to encourage environmentally sensitive fishing methods.